With you already 400 years! Take a walk through nature! You will be surprised by Its beauty! 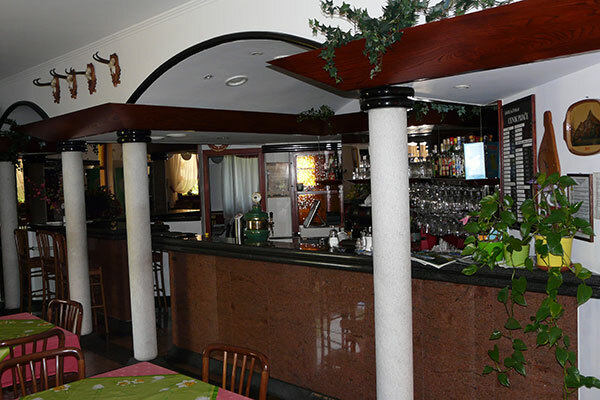 The Žvikar's is a genuine home-style restaurant with a long tradition. 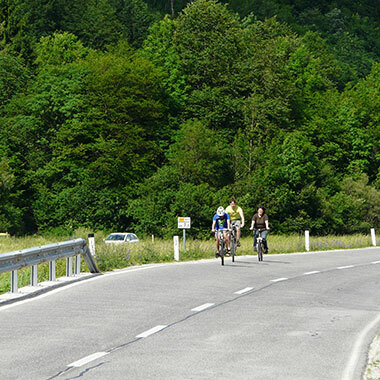 It is situated on the Kobarid – Bovec road, about 4 km before Bovec. The restaurant bar holds 20 seats. There is an adjacent smaller room for private parties of up to 12 persons, and a larger dining room which can seat up to 50 guests. During the warmer months guests can enjoy having a meal on the covered terrace with 50 seats. A friendly restaurant staff offers a variety of homemade food at reasonable prices. 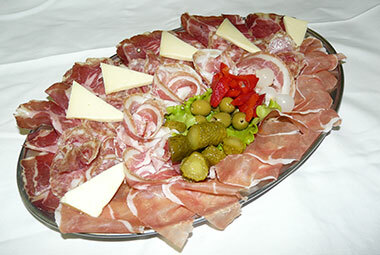 We swear by domestic locally produced food, typical of the Bovec area. Our homemade salami and other salt-cured meat products are very appreciated and the master of the house makes them according to his own recipe. In winter we offer our traditional homemade sausages with sauerkraut. Besides some marine fishes, we offer fresh trout from our own pond. Following Grandma's recipes and cooking on the wood stove, we try to offer as much freshly prepared home-cooked meals as possible, such as jota, vegetable and bean minestrone soup. It goes without saying that the seasonal vegetables from our garden are included in the offer. Everyone will find something to their taste, choosing from the varied and affordable list of dishes. Motor-bikers like grilled food, whereas cyclists and hikers prefer hot jota and our stews. Our guests often order fresh trout from the home pond or calamari which our restaurant is famous for. 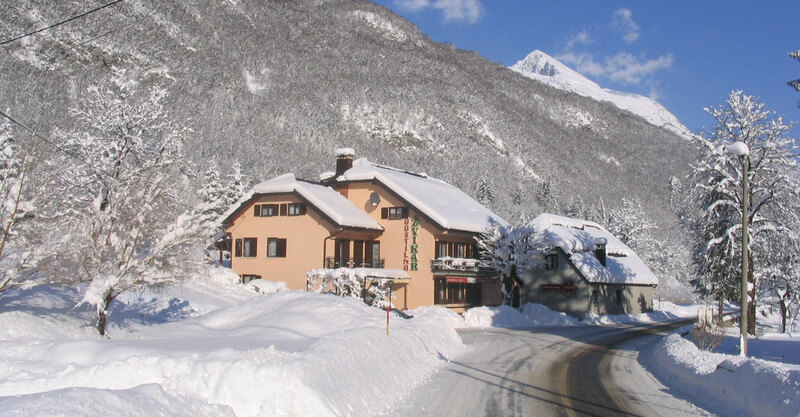 Usually guests like to complete the meal with the Bovec krafi or the Kobarid štruklji (both of them sweet dumplings), gibanica (a layered dessert), pancakes of all kinds, or delicious apple pie. Our restaurant is very old, so we have a tradition of making our own dry-cured and partly smoked salami, as well as ossocollo and rolled bacon. 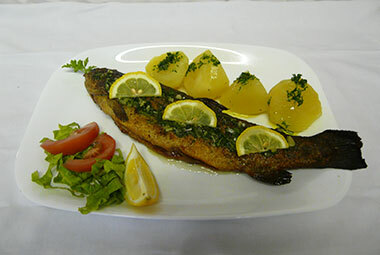 We offer grilled fish: trout, sea bream, sea bass and sole. 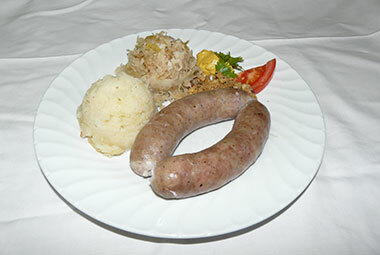 Sausage with sauerkraut, sauteed potatoes and greaves is the most popular dish in wintertime. Sausages are homemade and according to an old recipe lightly smoked. 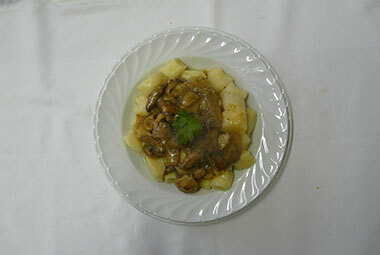 Homemade potato gnocchi are very tasty with any kind of sauce. They can be eaten as a starter or as the main course. 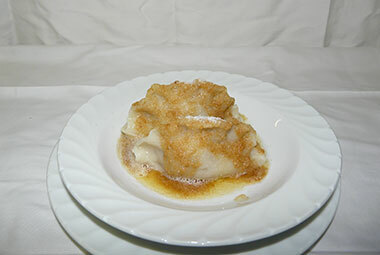 It is a typical Bovec dessert which looks like a big dumpling. The dough is filled with dried, cooked and minced snow pears, raisins, apple puree, walnuts and spices. In the end, the dumplings are coated with breadcrumbs fried in butter. 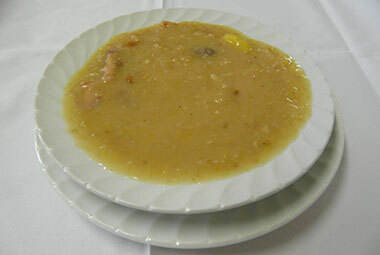 Jota and other minestrone soups are prepared according to Grandma's recipies. The seasonal vegetables come from our garden. Boka is the name of the waterfall, the gorge, and the torrent. 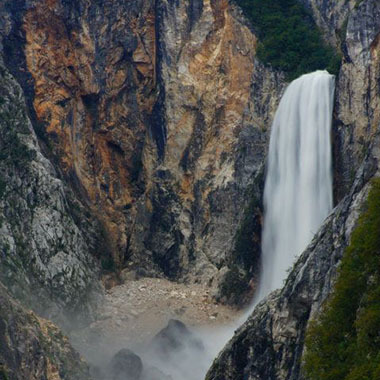 The powerful waterfall is 30 m wide at its mouth and it falls vertically 106 m deep. That is followed by 25 m of steep rapids. 700 m later it flows into the Soča river. 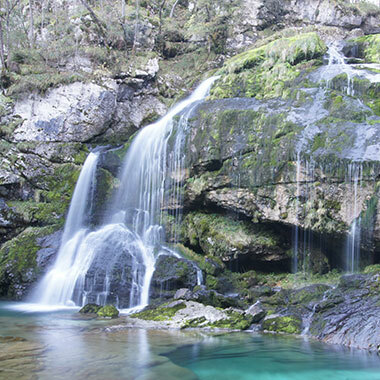 The waterfall is fed from the Kanin highlands, where there are also the well-known Bovec ski slopes. 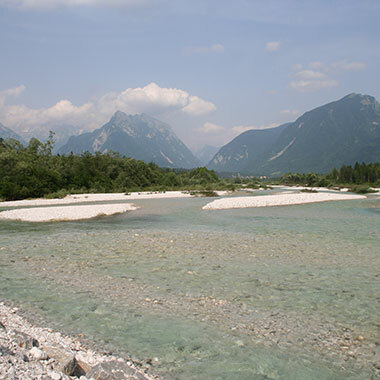 The Soča with its emerald colour runs in the immediate vicinity, just below Polovnik, and is famous as a river unique for adrenalin sports, but also for trout fishing. The most heroic visitors can have a swim in its cold pools in summer, others enjoy in sunbathing on the gravel river banks. 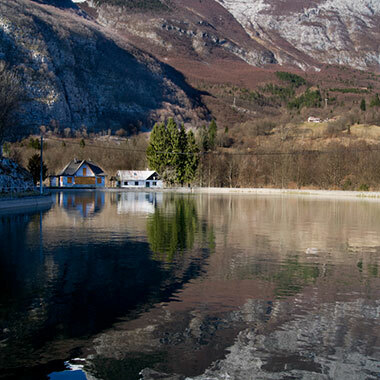 The Soča is also attractive to film makers. Some years ago several scenes of Chronicles of Narnia – Prince Caspian were shot on the Soča rapids. The waterfall is part of the Upper Gljun, which is a creek fed with the Kanin highland water sources. At the high water time when the snow on the mountins melts, or when there are heavy rains, the waterfall provides a powerful and frightening appearance. Otherwise it runs peacefully over beautiful moss-covered rocks into a deep pool. The climbing area is easily accessible by the path leading to it from the restaurant. It is located on the warm south wall, to the right of the Boka waterfall. 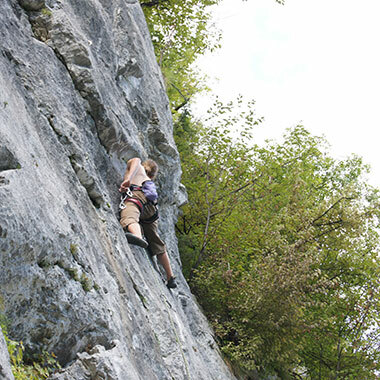 It has 11 climbing routes altogether diferring in difficulty grade. It is actually a water resevoir, known to the locals as the Plužna lake. It is fed from the Gljun creek, the source of which is nearby. Interestingly, the temperature of the water in the creek is constant throughout the year – around 5.5 degrees Celsius. From the lake, the water flows through a kilometer long concrete channel, providing a steep drop of water on the hydroelectric power station turbine. The Plužna power station has been operating since 1931. 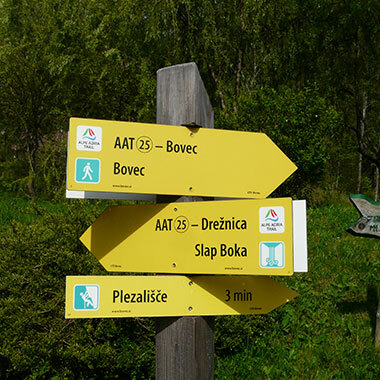 The hiking trail connects three regions – austrian Carinthia, Slovenia and Friuli Venezia Giulia in Italy. It is divided into 43 stages of 20 km, the total distance being 750 km. The trail leads past many natural as well as historical landmarks. 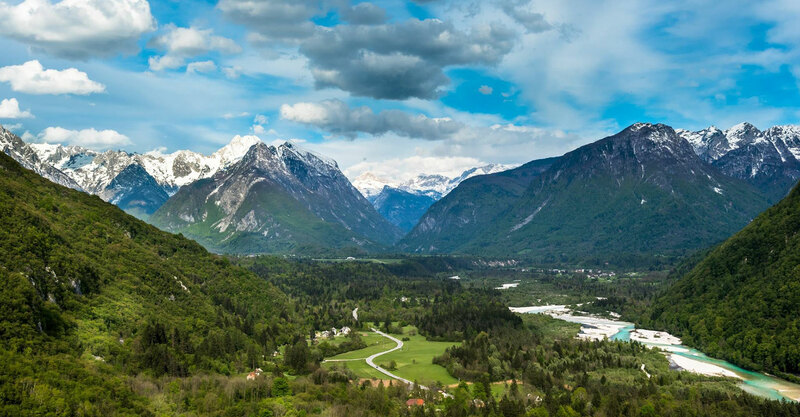 Bovec and its surroundings is an increasingly popular destination for lovers of road and mountain cycling. Each cyclist will find the suitable bicycle path. In a quiet environment of Podklopca, you can spend the day on the golf course. 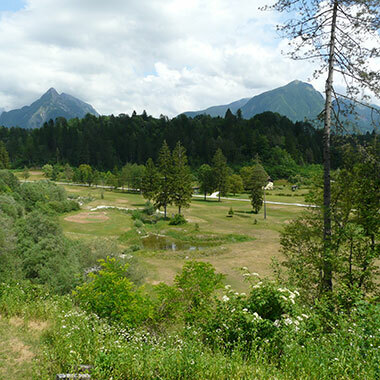 The course has 9 holes with typical Bovec names. 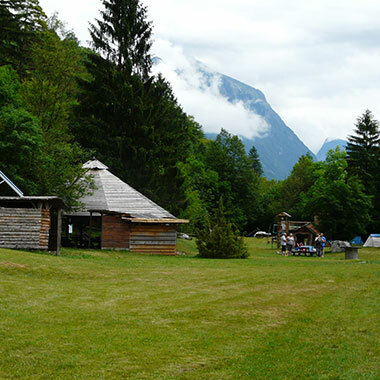 In the vicinity there is a campsite where you can spend your holidays in beautiful nature. Very friendly hosts will provide you action packed days with lots of memorable moments. Every day: 11:00 a.m. - 10:00 p.m.